Touchpanel control has become ubiquitous in our daily lives, from the grocery store to the bank to the home theater system. 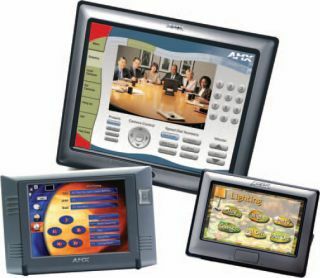 In fact, today's generation of electronics users are more likely to assume that any flat panel display has touch control capability; an assumption which has no doubt led to the early demise of more than a few "dumb" LCD panels. Basically, a touchpanel converts a flatpanel display into a graphical user interface (GUI) and data entry device. The basic concept behind a touchpanel is simple: they register a contact closure of a certain value that corresponds to a physical location, and they transmit that information to the control electronics, which then convert it to a specific function. Most touchpanels use one of thesefour basic technologies (or some variant thereof): resistive, capacitive, infrared, and surface acoustical wave (SAW). Resistive touchscreens use a thin glass substrate embedded between two layers of a plastic overlay. The surface of the glass substrate has a tin oxide coating onto which a slight electrical current is constantly applied. The plastic overlay and the glass substrate are separated by hundreds of microscopic dot separators. When pressure is applied to the outside of the overlay, the two surfaces touch and a ground occurs. These essentially act as contact closure devices. The x- and y-coordinates of the ground (touched area) are detected and registered with the control device, which then issues the appropriate command. A standard keyboard operates in much the same manner. With resistive screens, any pointing device can be used. These systems can be washed down and are able to meet ratings for NEMA 4/4X and Class I/II, Division 1/2 with intrinsically safe barriers, so they can be used for medical applications Drawbacks include the potential for damage (cuts) to the plastic overlay from sharp instruments and a reduction in display brightness because of the overlay. This type of touchscreen is usually the least expensive and easiest to use. In an infrared screen, miniature transmitters are located across two non-opposing sides of the mounting bezel. The transmitters emit IR light beams from top to bottom and right to left with receivers located on the opposite sides to form a grid pattern across the screen. When an object, such as a finger or stylus, interrupts the beams, the x- and y-coordinates are detected. IR touchscreens can be used with gloved hands or other triggering apparatus. However, they may not be suitable for direct wash down because of the IR diodes located on the outer bezel. They can also be activated by debris falling on the display surface if it disrupts the beams. Capacitive screens use a glass substrate with a tin oxide coating that is charged with an electrical current. When a conductive stylus or finger touches the surface, it creates a capacitive coupling that causes a current draw at that point, and the x- and y-coordinates are calculated. The glass substrate of a capacitive touchscreen is resistant to scratching, and the touchscreen system can be built to NEMA 4/4X standards. One possible drawback of capacitive screens is that gloved fingers will not activate the screen surface. determines the x- and y-coordinates. SAW touchscreens are durable and allow the use of gloved hands. However, since they can be built only to NEMA 12 standards, they aren't recommended for medical applications. They can also be activated by any dirt, grease, or liquids that fall on the surface. When we think of audio power amplifiers for commercial or professional applications, we tend to envision the standard 2-channel configuration. This makes sense, since most music applications use a stereo source, and a 2-channel amplifier is the perfect form factor for amplifying both left and right channels in a single chassis. But for a growing number of audio systems, "two" is not always the magic number. What about three- or four-way loudspeaker systems that use multiple crossover points? Or background music and paging systems with multiple zones? This is where a multichannel amplifier can provide a more convenient alternative. In the consumer electronics world, the proliferation of surround sound home theater systems and multichannel music sources has created an explosion in the number of companies offering more than one or two channels of amplification in a single product. But for commercial applications, the acceptance rate has been increasing at a somewhat slower rate. One reason might be that space and heat dissipation can be a bigger issue in commercial applications. In recent years, both of these concerns have been addressed by a number of manufacturers as they incorporate innovations such as Class D designs and switch-mode powers supplies, which use less power and generate less heat. Some manufacturers offer 4-channel models that output 100 watts per channel in a single rack space.